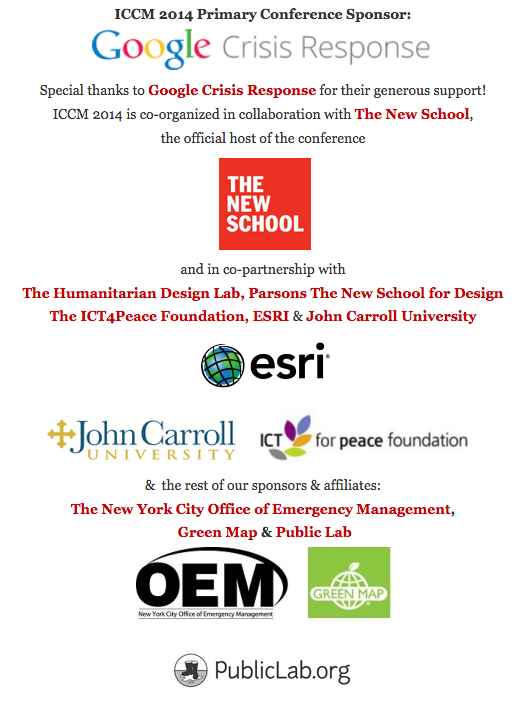 Thursday November 6, there are all day Public Lab workshops leading up to the International Conference of Crisis Mappers. These will require registration, stay tuned for exact details! A brief welcome presentation will orient people to Public Lab, connecting participants not only to “how-to” information but more importantly to the living, breathing community of practice who work together to make environmental science something anyone can do. Session 1: Aerial Mapping 9:30am-12:30pm. Aerial mapping of environmental disasters: Public Lab will lead a hands-on rig building activity so participants can prepare their own cameras for flight. Once our equipment is prepared, we will go outside to a nearby open air location (TBD) and--depending on the weather--employ either balloons or kits to lift several of the participant’s cameras into the air to capture photos. Back inside, we will review the captured images, and create a new map in mapknitter.org. Ground-truthing to complement aerial mapping of environmental disasters: Public Lab will set up four different tables based around the Construct, Collect, Scan, & Compare stages of the oil testing procedure, which help situate the workshop activities in the overall oil testing process. People will be able to build and improve spectrometers, prepare samples, scan them in pre-built spectrometers, and compare the results at the four corresponding tables. We will also post sheets with these four labels (Construct, Collect, Scan, & Compare), inviting people to contribute to the research process by asking questions, listing problems, and making suggestions -- which help situate the activities in the overall research arc in the Public Lab community. Also available will be “paper research notes” so new users can easily document their contributions and get credit in the Public Lab ecosystem. ICCM 2014 is co-organized in collaboration with The New School, the official host of the conference. The International Conference of Crisis Mappers (ICCM) is the leading humanitarian technology event of the year, bringing together the most important humanitarian, human rights, development and media organizations with the world's best technology companies, software developers and academics. As thus one of the few neutral spaces where such important conversations can take place, the annual ICCM conference brings together a wide range of diverse actors for important conversations that lead to concrete new projects and deliverables across a variety of diverse domains. As a community of practice, the ICCM thus helps facilitate new projects and catalyzes innovation in the area of humanitarian technology. Why New York? After sold-out conferences in Cleveland (2009), Boston (2010), Geneva (2011), Washington (2012), & Nairobi (2013), the decision to bring ICCM to New York was based on a desire to learn from a local community that clearly has much to teach us all. After witnessing the groundswell of general public support during Hurricane Irene and Hurricane Sandy, it became clear that the community in New York is already actively engaged in leveraging crowdsourcing, humanitarian technology, participatory mapping, and microtasking for support during a crisis. Thus, the theme for this year's event, Affected Communities in Spotlight, will focus on better engaging and understanding populations as the primary referent during a disaster. In keeping with our mission for this year, the organizers have incorporated the local response community and volunteer partners in New York into the conference agenda, and seek to build out more opportunities in this domain. As such, we have arranged pre-conference site visit opportunities to the New York Office of Emergency Management & an Adapting to Change Walking Tour with Green Map System, among others, and look forward to hearing about engagement from a local and global perspective. We are proud to announce our co-keynotes for ICCM 2014! Mathan Ratinam, Nigel Snoad, Maryam Ghofraniha, Melissa Elliott, Sanjana Hattotuwa, Heather Leson, Daniel Stauffacher, Tom Weinandy, Bill Myers (video), & Jen Ziemke together with many other colleagues. Thank you all for your valuable input! The International Network of Crisis Mappers (Crisis Mappers Net) is the largest and most active international community of """experts""", practitioners, policymakers, technologists, researchers, journalists, scholars, hackers and skilled volunteers engaged at the intersection of humanitarian crises, new technology, crowd-sourcing, and crisis mapping. The Crisis Mappers Network was launched at the first International Conference on Crisis Mapping (ICCM) in 2009. As the world's premier humanitarian technology forum, we engage 7,000+ members in over 160 countries, who are affiliated with over 3,000 different institutions, including more than 400 universities, 50 United Nations agencies & projects, first responders operating in both the civilian and military space, dozens of leading technology companies, several volunteer & technical community networks and global, national, and local humanitarian and disaster response and recovery organizations. Crisis Mappers leverage mobile & web-based applications, participatory maps & crowdsourced event data, aerial & satellite imagery, geospatial platforms, advanced visualization, live simulation, and computational & statistical models to power effective early warning for rapid response to complex humanitarian emergencies. As information """scientists""" we also attempt to extract meaning from mass volumes of real-time data exhaust. Crisis Mappers Net is not an organization or institution, and deliberately so. All of us connected here have very different goals, aims, strengths, interests, and backgrounds. As a network, we offer a neutral space for conversation and information sharing. As volunteer administrators, Jen & Patrick work to support the annual conference, host webinars on topics of interest, & manage the website & google group to facilitate collaboration. Thus, it is the important work of the members themselves that makes this group what it is. Crisis Mappers Net hosts an annual conference event, the ICCM. This event showcases best practices and most recent contributions, innovations, and deployments from the global community.While we connect and collaborate on projects virtually throughout the year, we feel it has never been more important to reconnect face-to-face in order to help build relationships, discuss common challenges, share lessons learned from past deployments and anticipate next steps together. We hope you can make it to New York this fall for ICCM 2014. We invite you to join our Google Group to participate in the latest discussions, ask questions, share & brainstorm, add yourself to the member map, learn what Crisis Mapping is all about, and view our list of member affiliations to learn about who we are. Pursuing other avenues for involvement? Visit our friends at the Standby Task Force & the Digital Humanitarian Network. I would like only to attend the workshops on Thursday, is there still room? Hi @jenniferdsara , unfortunately the list is already closed since last week :( Are you currently in NYC or in Amherst? Currently in Amherst, but travel back and forth to New York regularly. OK there will definitely be plenty of opportunities to experience both of these workshops again (balloon mapping and oil testing). If you haven't yet, check out publiclab.org/wiki/new-york-city and join the local mailing list around here.